Related tags: kvm, kvm-hosting, lumail, misc, spam. Yesterday I received an automated alert from my kvm-hosting host-machine, informing me that one of the drives in the RAID-pair had failed. I like reliable systems, and sometimes it's worth remembering just how well they can work. In other news I'm currently continuing to chase a new job. The companies I've approached, or which have approached me, are being a little slow in replying which is a shame, but I'm not hugely concerned .. yet. I'm going to give things another week, or so, and then add a banner to the Debian-Administration website, and see if that results in anything interesting. In the meantime I've got some wood, and a new mitre saw, and I will be spending the remainder of today working on my new desk. Doing physical things is always fun, and right now especially. Tags: jobs, kvm-hosting. | 9 comments. Today I took down my KVM-host machine, rebooting it and restarting all of my guests. It has been a while since I'd done so and I was a little nerveous, as it turned out this nerveousness was prophetic. I'd forgotten to hardwire the use of proxy_arp so my guests were all broken when the systems came back online. 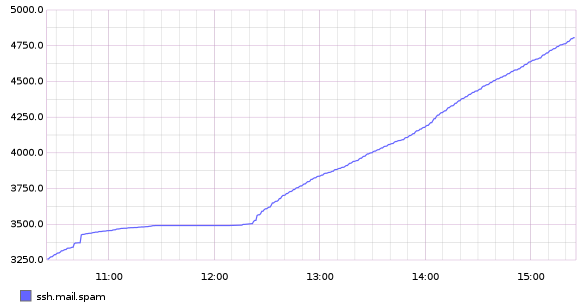 I think it is obvious where the downtime occurred, right? In other news I'm awaiting news from the system administration job I applied for here in Edinburgh, if that doesn't work out I'll need to hunt for another position..
maildir - Viewing a list of maildir folders. index - Viewing a list of messages. message - Viewing a single message. As a result of a lot of hacking there is now a fourth mode/state "text-mode". Which allows you to view arbitrary text, for example scrolling up and down a file on-disk, to read the manual, or viewing messages in interesting ways. There will be a new release within the week, I guess, I just need to wire up a few more primitives, write more of a manual, and close some more bugs. Happy Thursday, or as we say in this house, Hyvää torstai! Tags: jobs, kvm, lumail, misc, spam. | 1 comment.